The Turtle Rock Men’s Club has been meeting for many years. It is a great way to have a good meal and meet other guys in our community. The club meets regularly once a month, usually the third Wednesday, for a lunch at a great local restaurant. Our lunches are almost dinners with a salad and/or dessert, entrée, and non-alcoholic beverage included. Occasionally there are speakers giving a short presentation about a topic of interest. Look for the next lunch invitation in the Turtle Rock Newsletter or the “sandwich board” sign placed at the entrances to Turtle Rock. If you have any questions, please contact Jim Cerny at 841-926-7888 or Mike Geramanis at 630-212-7003. 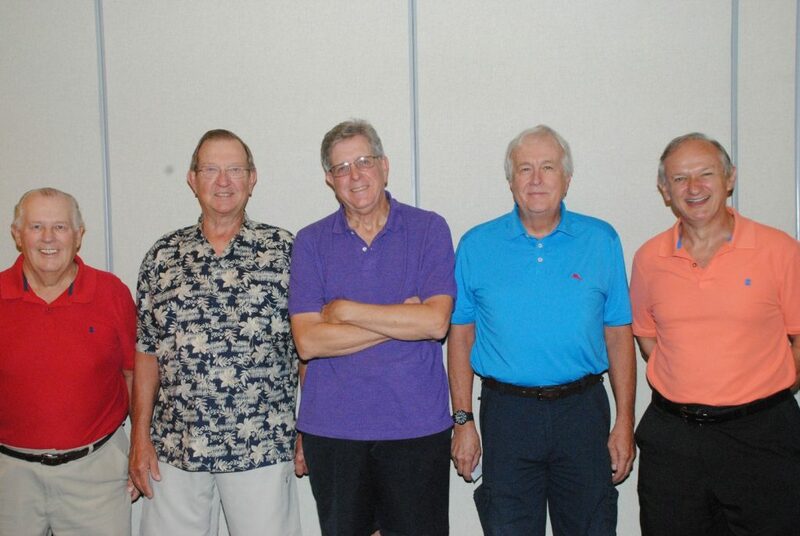 The Men’s Club held its annual meeting on Wednesday January 16th at Miguel’s restaurant on Siesta Key. Of note, a vote of thanks was recorded for a job well done by outgoing President Dave Wallace and by outgoing Secretary Mike Geramanis who have concluded their terms of office. Their many contributions to the Club have been much appreciated. Thanks were also given to the guest speaker, Sarasota’s Supervisor of Elections Ron Turner, for a vibrant and interesting talk. Membership Dues continue at $20 per annum. The next lunch meeting will be at noon on Wednesday February 20th in the Galleria room of Mattison’s 41 restaurant at 7275 S. Tamiami Trail. Club members will be contacted by email with luncheon details and to ascertain their menu selections. Non-members are welcome to attend but they should contact Jim Cerny beforehand on 941 926-7888 to make a reservation. This enables the Club to give the restaurant an accurate estimate of attendance and menu choices. The Club is arranging its annual outing to a Spring Training baseball game at Ed Smith stadium in Sarasota. We have selected the game versus the Boston Redsox at 1:05 pm on Friday March 8th and are in the process of obtaining tickets. John Adams is making all the arrangements and will inform Club members of final details by email. Non TRMC members are welcome and can find out details by contacting John on 203 314-2099. Those who help make it happen (left to right): John Adams, (Treasurer), Dave Wallace (President), Jim Cerny (Secretary), Mike Geramanis (Vice President), and Claude Pierre (Second Vice President).